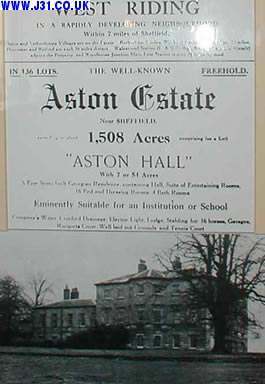 The old Aston Hall was destroyed by fire in about 1767. This Aston Hall was started in about 1772 and took nearly 50 years to finish. It was designed by the architect John Carr for the 4th Earl of Holderness. The poet Lord Byron used to stay here. Prior to 1790 Aston Hall was owned by the D'arcy family (the Earls of Holderness) also of Hornby Castle in north Yorks. 21 August - Byron stays at Aston Hall where he has an affair with Lady Frances Webster/Annesley [presumably the hall was being let to the Webster's as it appears to have been owned by the Verelst's at the time]. Robert D'Arcy, 4th Earl of Holderness died in 1778 and the Hall was sold to the Verelst family, in about 1790. Harry Verelst who bought the place succeeded Clive of India as goveror of Bengal (then part of the British Empire) and had made his fortune within the East India Company. In 1928 the estate was broken up in many lots, with the hall sold off to one Sir Ronald Matthews, J.P. Copies of the advertisments of the sale are on show in the Blue Bell pub/hotel just down the road from the hall e.g. 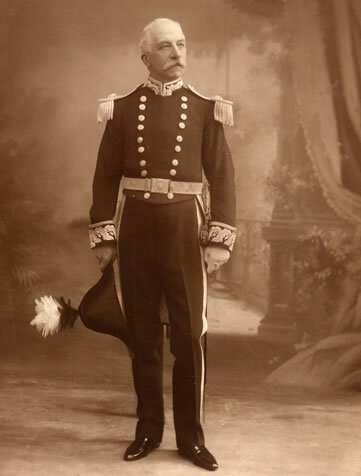 The gentleman in the photo is Harry Wilson Verelst who was squire of the Aston Hall estate in the late 19th/early 20th century. The line in the sale ad 'Eminently suitable for an Institution or School' was prophetic as by 1948 the hall had been bought by the West Riding County Council as a home for female psyciatric patients. So, apart from being a very grand private residence, it has also served as a mental hospital, and is currently a luxury hotel and and entertainment venue, e.g. jazz nights. During the Euro '96 football tournement, the Portugese national team stayed here as they played matches in Sheffield (8 miles west, and Nottingham 30 miles south down the M1).